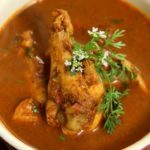 A Bombay chicken curry is an excellent mix of the many fragrant spices. This is a tried and tested recipe, a family favorite. It's simple to create and quite delicious. This makes a fast and easy dinner combination. Heat oil in a saucepan, add vinegar, coconut, garlic, cumin, turmeric, chili, pepper, ginger and curry leaves. Saute for 2 minutes.